Coming up this Wednesday will be the Halloween lead-up week for the final Haunted Vancouver Trolley tours! Don’t worry if you haven’t gone yet, the run four times a night! Every hour, a 2 1/2 hour tour kicks off from Canada Place and tours around and across the streets of Vancouver. Think you know of Vancouver’s neighbourhoods? See them in a different light (or lack thereof) and hear the spooky tales and meet the ghosts. 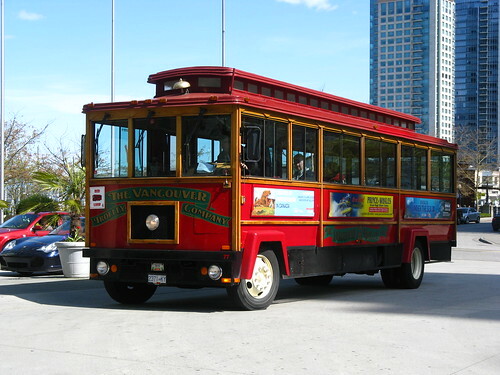 The trolley makes stops at both Mountain View Cemetery and the Vancouver Police Museum’s Autopsy Room! The event is reserved for adults and youth 13+, and a reservation is required ahead of time. 2 1/2 Hour Tours depart Wednesday through Sunday (and Halloween Monday!) from October 12, 2011 — October 31, 2011. Tour times are 5:30pm, 6:30pm, 7:30pm & 8:30pm Wednesday through Sunday. Extra tour time of 9:30pm on Fridays, Saturdays and Halloween Night! Entered to win tickets to the Halloween Haunted Vancouver tour http://is.gd/lb4DhK via @VanTrolley & @Hummingbird604 – you can too! Contest closes Wednesday Oct 26th at 3PM. I remember driving home alone after a night class at UBC and that’d always be a little creepy thanks to the urban legend of the UBC ghost. OooooOOOOoo I’ve always wanted to go on these. Maybe this is my year! I have heard about the Police Museum’s Autopsy Room, I think that would be one of the spookiest places around! The old Watson Glove Factory building at Main and 2nd is pretty spooky. The building’s been standing for roughly 100 years and more than a few people I know, myself included, have tails of the hair on the backs of their necks standing on end when they’ve been alone in the old factory basement, sometimes hearing whispers and the creaks and scrapes of furniture being moved around. The building definitely has presence. I have family members buried in a small country cemetery – headstones from the early 1800s. As a child my older brother told me the broken head stones were the signs of the dead trying to get out…that did it for me! Inside Pacific Spirit Park, although it’s beautiful. Bodies have been discovered there. The Burnaby Art Gallery! The building has an intersting history. There are reported sightings of a woman dressed in an old fashioned white gown who strolls the halls and walks through walls. There is also the figure of a man in old fashioned clothing who stands at the top of the main staircase. These two ghosts are believed to be Henry and Grace Ceperley!! The alleyway leading to my house between 25th and 26 Avenues on Gladstone Street. It’s very dark and quiet with lots of creepy foliage. Sometimes walking around Shaughnessy late at night – near Shaughnessy Heights Church on West 33rd Avenue – can seem pretty spooky. The lighting is very dim and the houses are set so far back from the road that it’s easy to feel like you are all alone out there. Under the Burrard Bridge. I walked there once, and could not shake the very urgent feeling to get out of there ASAP. Bonnie, now that you mention it, I’ve had exactly that feeling too under the Burrard Street Bridge.